"To the family , my deepest condolences, so sorry for the..."
"Deepest Sympathy to the family and friends." "DEEPEST Sympathy To The Family: from Cassandra @..."
"My deepest sympathy to the Thibodeaux family in your time..."
"Judy Augustus Guy of baton rouge,la class of 77"
Don was born November 23, 1959 and passed away April 9, 2019 at the age of 59. He was a native and resident of Baton Rouge. 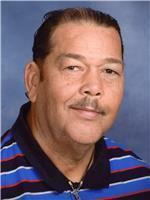 Don graduated from Capitol High School and remained a faithful member of St. Paul the Apostle Catholic Church. Don is survived by his son, Don Thibodeaux, Jr.; siblings, Sheryl, Curtell, Marine, and August Thibodeaux; granddaughter, Miracle Thibodeaux; and aunts including, Mrs. Mable King. Don is preceded in death by his parents, Curtis and Annie Thibodeaux, and a brother, Leon Thibodeaux. Visitation will be on Tuesday, April 16, 2019 at St. Paul the Apostle Catholic Church (3912 Gus Young Ave., Baton Rouge, LA 70808) from 8:00 am until the Rosary at 10:30 am. The Funeral Mass will follow at 11:00 am celebrated by Rev. Richard R. Andrus, Jr. SVD, Pastor. Burial will be at Roselawn Memorial Park. The repast will follow the burial at St. Paul the Apostle Catholic Church Center (3920 Gus Young Ave., Baton Rouge, LA 70808).